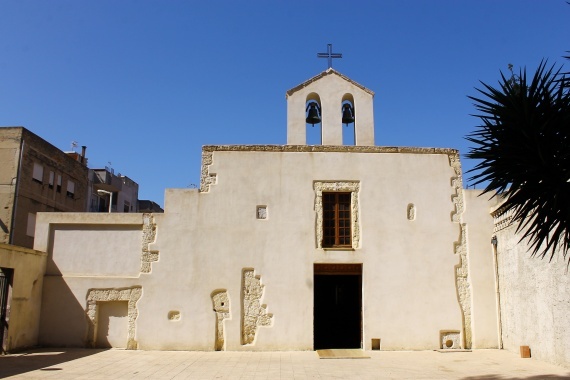 The church is devoted to the fifth bishop of Cagliari and is located in the place of his hypotetical martyrdom. It has a simple facade, a portal overtopped by a rectangular window and a bell tower. The Church is dedicated to Sant'Avendrace, fifth bishop of the city. The building is located on the site where , according to the tradition, the saint was martyred. The facade is simple, with a portal surmounted by a rectangular window and a bell tower. Inside there is a single nave with pointed arches and side chapels covered by barrel vaults. The church stands on a small subterranean environment, of rectangular form, which is accessible through a trap door in the floor near the entrance. Tradition has it that this was the cave where the bishop Avendrace tried to hide himself during persecutions , and where he was buried after his death in 87 AD .The roofing has a vaulted ceiling, and close to a wall there is a holy well believed to be miraculous. Throughout its history, the Church underwent some renovation works and changes which make difficult to define the original dating . Furthermore, the first church was oriented in a different way, with the apse located at the point where now lies the entrance , so that the crypt was just below the altar. This fact leads us to believe that the temple was built in honor of the burial place of the saint. The crypt was modified after the restructuring in1952; it was covered with a layer of concrete for protection , causing a significant decrease in the volume and changing the original appearance.